Unity Park Motel – "Best location, unbeatable value!" Welcome to Unity Park Motel! Best location, unbeatable value with free internet? Namba Wan! Want to spend more on diving and sightseeing, and less on stuffy accommodation? Look no further than Unity Park Motel. 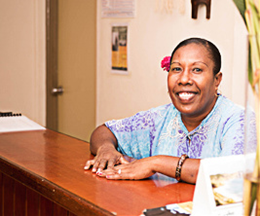 Located right in the middle of town, opposite of the only public park in Luganville, we offer a range of accommodation from basic bunk lodgings with shared bathrooms, to double sized beds with a breezy sea view from your private balcony. Rooms start from VT 2,200 (around $20 AUD) a night. Unity Park Motel © 2016.